AwesomeSawce enables you to make supersaw instruments, and even trippy ‘superwave’ versions of sinewaves or anything coming out of Overtune! On this page the parameters are explained. You can download the latest version here. Basics of a supersaw: instead of 1 sawtooth wave that’s tuned perfectly to the keys on your keyboard (be it pc keyboard or midi instrument), a supersaw instrument has multiple copies of the same sawtooth wave but every single one just slightly detuned. 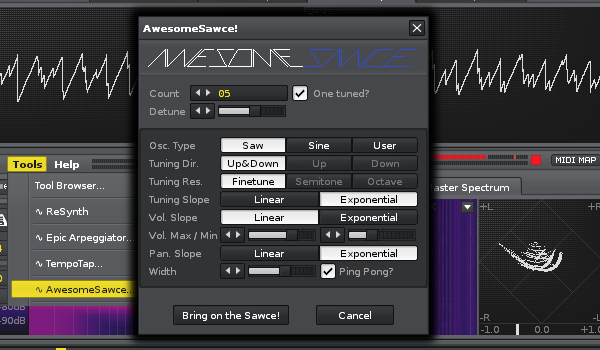 With AwesomeSawce you can easily make a detuned or ‘Unison’ version of any single-sample instrument. It doesn’t even have to be a looped waveform; you can also use it to fatten up drum sounds. Enter how many detuned copies you want. Be careful: the tools maximum here is 7, but Renoise has logical limits such that 6 is suitable or even just 5 if you keep the ‘One Tuned?’ option on. This count parameter goes per-side, that is, if you turn it to e.g. 4, 4 downtuned and 4 uptuned copies will spawn. Whether to keep the ‘original’, the tuned version of the wave. Notice that it still leaves sample mappings for it if you uncheck, so you might have to delete that mapping. Should speak for itself; if you do not supply a sample, AwesomeSawce can create a simple supersaw or supersine instrument for you. The saw is default when you launch AwesomeSawce from an empty instrument. The further the detuning stage (call the number at the top labeled ‘Count’ the different stages), the more detune is applied in the direction of the Detune parameter. Here you can set the shape of that slope, ‘Linear’ being normal detune and ‘Exponential’ a harsher detune. The slope has the same meaning as with Tuning Slope. Read Max/Min carefully: the Min parameter signifies the minimum amount of volume drain the detuned copies will have, i.e. the first stage detune will have 0.0dB – Min parameter. The last stage will have 0.0dB – Max. If Min > Max, Min will be taken as volume drain for all stages. The pan slope determines how the detuned copies will stand in the stereo field. You can disable this by simply turning the ‘Width’ parameter all the way to the left, to zero. Ping Pong gives you the very useful option to bring balance to the unison. If you have a very high width and Ping Pong is turned off, the uptuned, higher frequency copies will sound at the right and the downtuned will be hearable on the left side. So Ping Pong flips the sides around every other stage to balance the down- and uptuned copies over the stereo field. If Width is zero Ping Pong will not have any effect. Also, please be aware that every track in Renoise also has two panorama parameters which can have an effect on the sound. Tuning Dir. / Tuning Res. Direction and resolution are not implemented yet – they won’t change the behaviour of AwesomeSawce.